As a Michigan native, Sanjeet Rangarajan, MD honed his manual dexterity skills and his interest in solving complicated technical problems while working summer jobs in the automotive industry during his high school and college summers. Powertrain engineering, after all, actually has much in common with, say, planning the surgical removal of a rare brain tumor such as a craniopharyngioma, a procedure he recently performed on a middle-aged man. 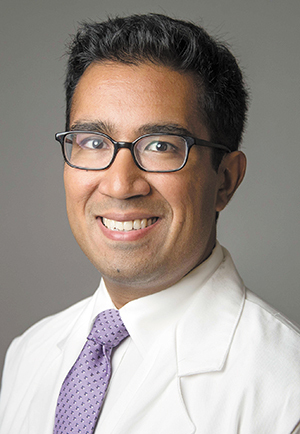 "Building cars is a team sport, and so is medicine," says Dr. Rangarajan, a fellowship-trained rhinologist and director of the Division of Rhinology and Endoscopic Skull Base Surgery at the University of Tennessee Health Science Center. "There are so many parallels. When you're dealing with automobiles that people are relying on to use every day, you have to be very exact and meticulous in your planning. "It's the same thing with surgery. A lot of success with how a surgery goes doesn't start when you enter the operating room. It begins earlier in the planning phases and working with your colleagues. Working with your hands? Yes, that's where I got my start. It wasn't on patients. It was definitely on automobiles. I learned a lot about technology and how to solve problems while working at Chrysler Corp."
His path toward a career in perhaps redesigning the Jeep Grand Cherokee got sidetracked at Vanderbilt, where, as an undergraduate in biomedical engineering, he was randomly assigned to a head and neck cancer surgeon named Dr. James Netterville. "I followed him to surgery every Wednesday for a year or two and I really learned a lot about what it means to be a physician and surgeon, but also what it means to really take care of people and to understand a person's disease and how it affects their life," Dr. Rangarajan said. "His example was a very powerful example for me, and that's probably why I went into otolaryngology, to emulate him. "I found that I really enjoyed working with people and trying to identify the problems that people faced more than I did delving deep into the esoteric mathematics of solving these issues." After medical school at Michigan State, he did his residency training in otolaryngology - head and neck surgery at The Ohio State University and his fellowship training in rhinology and endoscopic skull base surgery at Thomas Jefferson University in Philadelphia. "I came to UTHSC because Memphis is known to be the epicenter of allergic rhinitis and chronic sinusitis, which has a lot to do with our geography and our humidity in the air and the types of allergens that are circulating in the air," Dr. Rangarajan said. "So I definitely knew this was going to be a hotbed of that type of activity, and also there's no other fellowship-trained rhinologist for 200 miles of us, so that's an exciting opportunity that I was attracted to." About 70 percent of his practice focuses on people with sino nasal and allergy-type disorders, though he enjoys the challenge of diagnosing rare brain tumors and the delicate surgical skills involved in removing them. "The reason I chose otolaryngology is that I really appreciate the very complex anatomy," he said. "The head and neck is a small area, but the nose and the skull base is even tinier, yet there are so many important things that happen there. People's sense of smell and taste allows them to enjoy food and sense their environment. All of these things make it a really fascinating area." While just seven years out of medical school, Dr. Rangarajan already has noticed changes in his specialty and in the field of medicine in general. "For sinus and allergy, we've really moved away from a one-size fits all, putting people on nasal spray and see how they do and if that doesn't work do surgery," he said. "We realize now that one size does not fit all and so a lot of our treatment and methodologies that we do for people is very personalized now. You have 10 people come in who can't breathe through their nose and they may have 10 different problems and 10 require different treatment plans. "I think that personalization of medicine is the No. 1 thing that's changed, and it's not just unique to my field, it's true in every part of medicine." Other advances include the use of robotics in head and neck cancer surgeries, and in sinus care the use of navigation and image guidance techniques allows the surgeon to map a patient's CT scan and MRI to their facial features in the operating room. "We can track our instrumentation to within one millimeter of their exact location, and it helps us improve both patient safety and efficiency in the operating room," Dr. Rangarajan adds. "Another big thing that's really helped people with sinus and allergy problems is new drug-delivery mechanisms. We've found that we can target medication to tissue using new devices that are coated maybe with steroids that degrade over a period of two months in the nose. New ways to introduce medication into the nose is definitely a big advance in the last 10 or 15 years." While this steady flow of scientific advancements is resulting in improved patient care, it also can put additional strain on medical students who are still trying to digest Gray's anatomy. Dr. Rangarajan touches on this dilemma in a talk he has given titled "Dissecting the Education of a Surgeon." "The crux of the talk is that medical education has really changed quite a bit because there's so much more to know now than there was even 10 or 15 or 20 years ago," he said. "If you think of things like the Human Genome Project and understanding genetics and understanding the basis of disease, there's just so much more the physician has to know today, and at the same time medical school is still four years. "So my talk was really about how do you deal with the challenge of delivering that education in the same amount of time while still focusing on wellness and preventing physician burnout." Dr. Rangarajan, who is engaged to Laura Wichman, a high school teacher he met in Columbus, Ohio, during his residency, has an anti-burnout program that includes keeping up with his energetic Golden Retriever named Pepper, playing tennis and cooking. His specialty is Thai food, which he developed a fondness for on a trip to Thailand several years ago. "The challenge is to find these uncommon ingredients, so I'll spend Saturdays going to the Winchester farmers market, the Vietnamese market in Midtown and the Indian market in Southaven," Dr. Rangarajan said. "After I've gone to four or five places to get everything I need, then I spend the rest of the day making five or six courses of Thai food. I think that's my favorite thing."